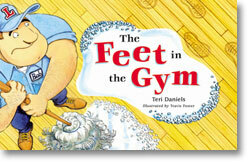 "Teri Daniels's The Feet in the Gym takes listeners through a day in the life of a hardworking custodian named Handy Bob as he bustles and buffs, swabs and swings his mop, keeping the school's gym floor free of footprints. The story offers good clean fun through lively rhyme. Travis Foster's colorful, shiny cartoon illustrations highlight Handy Bob's plight as footprint after footprint continues to appear, in spite of his best efforts." "Handy Bob, custodian at Lakeside School, has his hands full trying to keep the school clean, but he does his job with pride and joy. Keeping the footprints off the gym floor is his special challenge, especially as group after group come in with their own particular messes: the Girl Scout's cookie sale, the soccer team with dirt and grass on their cleats, the dance troupe, and, worst of all, the art class, with all the colors of the rainbow dripping from their brushes. Told in rhyme . . . on humorously illustrated double-page spreads, the story will delight children as they see their school day through the eyes of the one who cleans up." "In a rhyming monologue, Handy Bob, the janitor at Lakeside School, tells readers why it is so difficult to keep the gym floor clean. If the kindergartners aren't tracking across it with their little footprints, the first-grade Brownies are dropping sticky crumbs from their cookie sale. The soccer team leaves behind bits of tattered grass, and the ballet dancers swirl them all over. The art class arrives, and then the marching band. Poor Handy Bob is genuinely distressed until he sees that ‘Joy of joys! My lucky day!/ The children marched the mess away!' The floor is clean except for one purple spot expertly mopped by the smiling man who takes great pride in his job. The last page shows Handy Bob exiting the gym, blissfully oblivious to the footprints he has left on the floor. Children will enjoy this industrious janitor who sports a large key ring on his belt, wears his sleeves rolled up, and has a dimple in his chin. The watercolor cartoons are bright and colorful and filled with Handy Bob's friendly facial expressions. Good clean fun."